I just thought I would mention (finally) that I have moved all my Zentangle information - classes and posts to my other blog - CraftingPassions.blogspot.com. It is much easier for me to manage just one blog so please feel free to join me there. Been Awhile But I Have Strings! Hello everyone, I know it has been a while since I posted last but ya'know..... life! I have been working at making more time in my schedule for Zentangle practice and I thought I would try working on a string a day. 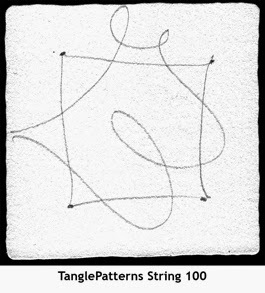 Tanglepatterns.com has a couple of String ebooks with 50 different strings each. Strings are important to the process of Zentangle as it sets our boundaries to work within, or not. They are usually drawn freehand lightly with a pencil. Give String 100 a try and let me know how it turned out. I had the pleasure of attending Tangle University last week in Portland Maine. This three-day conference is put together by Elaine Huffman (along with many volunteers) and is only for Certified Zentangle Teachers. 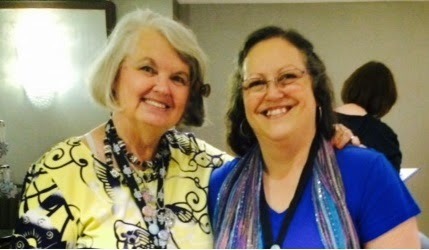 I had a wonderful time meeting many Tanglers whose blogs I follow and had the opportunity to speak in person with the likes of Marie Browning, Suzanne McNeil and Sandy Stein Bartholomew. So exciting! There were so many really great presentations by amazing Zentangle artists. I learned so much that I am still trying to process. Look forward to some interesting classes in my upcoming schedule based on what I learned. Sakura of America made a fabulous presentation and shared with us a sample of most of their different pens and markers. I made a tile to share with Glaze, Metalic and Moonlight pens. I used a Zentangle tan tile as my base and tangled Abacus, Adele, Popva and Fluttertile from Sandy Steen Bartholomew's Tangle app (that's all I had available while waiting at the airport and that's all I needed). Then added Nzepple. I recently taught two beginner Zentangle classes; one at Scrapbook Central and one in my own studio (aka dining room table). After teaching 24 and 17 respectively at the Elder College I am finding that I really enjoy the smaller, more intimate class size of 4-5 students. Every beginner class starts with the basics of Zentangle while creating that 1st tile with standard Tangles like Crescent Moon, Hollibaugh, Tipple and Knightsbridge. When it comes to the second tile I have been experimenting a little bit with the string and combination of Tangles. Poke Root, Poke Leaf and Cadent are a given, but then I change up the remaining Tangles depending on the desires of the group. It seems that some are more comfortable with grid-based Tangles and some prefer the more organic Tangles. In any case, I am totally have a great time Tangling and sharing this wonderful art form! We had a wonderful final class at the Elder College on April 3rd. We worked with tan tiles and learned a few new Tangles. I really like the tan tiles with the combination of black, brown and white ink. They effect can be so dramatic! This part of the class where we put all our tiles together and have a good look at what we all created is such a wonderful experience. The comments from the group are so special - one of my favorites is "I never know I could draw!" After two back-to-back 4-week courses at the Elder College I thought it would be fun to get the students together and share what they have been doing since their class. We had a wonderful time of sharing, oohing and awing the wonderful tiles and ZIAs that have been created by these new Zentangle artists. I am looking forward to returning to the Elder College in the fall with another beginner course and something new - Zentangle Explorations! I am continually amazed and pleased at the natural creativity and drawing abilities that people say they do not have. I constantly here "I can't do that" or "I can't draw" and yet they end up producing wonderful works of art. 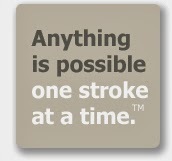 As Rick Roberts says, "Anything is possible one stroke at a time." This week I designed the course to follow the Diva Challenge in hopes of introducing my students to the fun of entering the challenge and seeing all the work from other participants. So, as Laura Harms said in her post for her weekly challenge #160 - spiral out and keep going. Entering the challenge is very easy. If you have a blog or post to Pinterest you can link directly, but if you do not, just email her the picture of your completed tile. Have fun everyone and Tangle On! My second Elder College course started last week with 17 students. We got off to a great start learning the basics of the Zentangle method and the students couldn't help but remark that even though they all learned the same thing they each created something just a bit different. I have to say that I am really enjoying teaching at the Elder College. It is a great setup for the more experienced folks in our community. They can get out and learn new things in a safe environment that is very reasonably priced. We only have 1 1/2 hours for each of the 4 sessions and the students keep telling me that they wish they had more time. This week we learned the second half of the beginner Zentangle course. Next week we will start to explore the black tiles! The next In The Beginning class is scheduled for TBA in my studio. Cost is $45 payable in advance of the class date. I am teaching a 4-week course at the Elder College connected with North Island College. If you are 55 + you may find this a convenient and cost effective class. The next session will be in October with registration starting in September. Please be sure to register with North Island College before attending. I love crafting of all kinds, especially working with paper and wool. I love learning new things and like to try different techniques. I fell in love with Zentangle drawing and became a certified Zentangle teacher in November 2013. You will find information about Zentangle classes and products here. Another of my passions is scrapbooking and you will see all my new projects as well as information about classes and tutorials on this blog. Join me on my crafting journey and be sure to share yours as well.